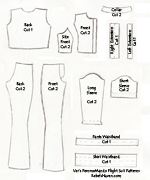 Here are my directions for making a 2-piece female flightsuit. I made a drawing of the pattern shapes, and with these instructions you should be able to either drape/draft your own or modify exhisting patterns. Click to expand. The flightsuit needs to be fitted but relaxed. If you can't draft patterns from scratch, I'd advise finding similar patterns and alter them. For the bodice, any fitted cut would work, be in darts or princess seamed. I used a Princess Seam shape to mine. McCall Pattern 5471 would be a good pattern to use as it has Princess Seams, a high collar that you can adjust to fit a mandarin collar, and straighter sleeves that aren't poofy at the caps. You will also need to find pants that go to the waist, with whatever cut legs you prefer. I prefer boot cut, which would fit a more Jango-style leg. Leg shape is something you can easily customize, however. Look for fly-front pants. Vogue 7881 is wait high but would need leg contouring. I would suggest making a flightsuit out of a cheap material first so you can get everything fitted together. There are a few things to keep in mind when starting your flightsuit. Keep in mind the fabric you are using. I recommend a good stretch twill, which will help with comfort and movement. Most good bottomweight twills won't have too much stretch, however and you would want a strong, pant-weight fabric. You don't want your flightsuit to be uber-catsuit-fitted, especcially in the back. Be sure to build in some room. Because the pants and bodice are attached, when you bend, squat or sit, you will be putting a lot of strain on your pants and back waistband and you don't want to split your suit and flash your undies... as much as the males might disagree ;) You will also need room in the sideseams, and room in the armholes. [PANTS] These pants need to go all the way to the waist. In most situations, if your pant patterns include darts, I would remove them unless you are very curvy and would need that nip in to fit. You don't want the pants tight at the waist. You would pretty much follow the pattern on the pants minus your own modifications, and the waistband. Do not put on regular pockets if the pattern includes them. If the pattern comes with a separate fly front, I would just add that to the pants front as I have pictured, which at least gives you extra fabric. Study the fly front on your jeans, and your pattern; I extended the same method in the bodice, and studying how your pant fly front goes together helped me form this pattern. 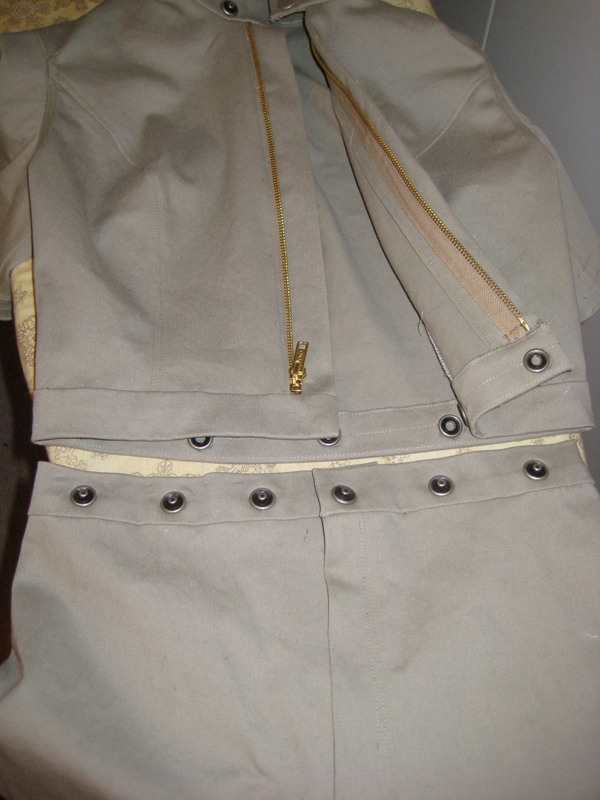 Finish your muslin and put aside, you will need to match the fit of your pants to the fit of your bodice. [BODICE] Put together a muslin using you fitted shirt pattern. You will want to mark the pattern around the waist; this is where your pants and bodice will join via waistband. Your back should ideally be one piece. Since this isn't supposed to be too fitted, you can take your muslin of your back pieces sewn together, lay them as flat on paper as you can, and trace. The front curves will need to stay fitted. The front left piece will need to either extend about 1.5" from the center front (same width as you choose for your pant fly front) or you can sew on a separate extension as I have pictured in the pattern. 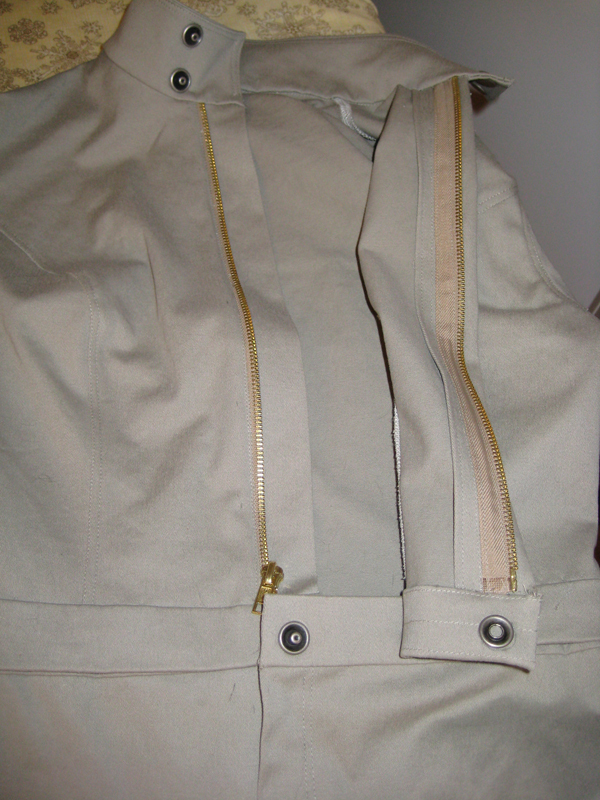 Your pant right front will have an extension that folds in half and is set behind the zipper. The right front bodice will need an extension the same width. The left front will be overlapping around center front, and since the zipper teeth need to be hidden, you will want to add maybe an extra quarter to half inch on the right front. The same holds true for the right front pants, which is why I prefer to add that extra fly front fabric right onto the pattern. I would suggest stopping here before moving onto the sleeves as you need to fit your bodice and top together. 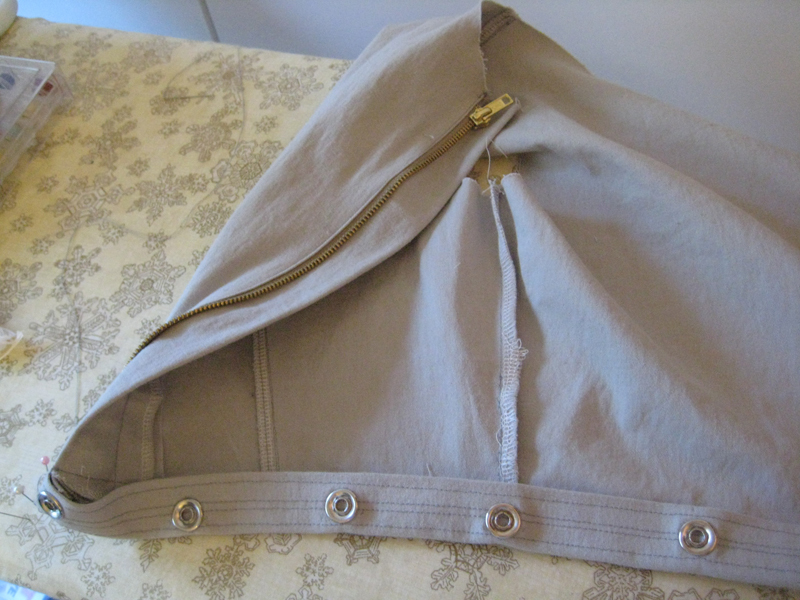 Pin together the bodice to the pants. Here you can see if your pants and bodice match up, and you will need to take away or add fabric to either bodice or pants until both match up. You can do this in the pattern phase if you know your way around pattern adjusting. 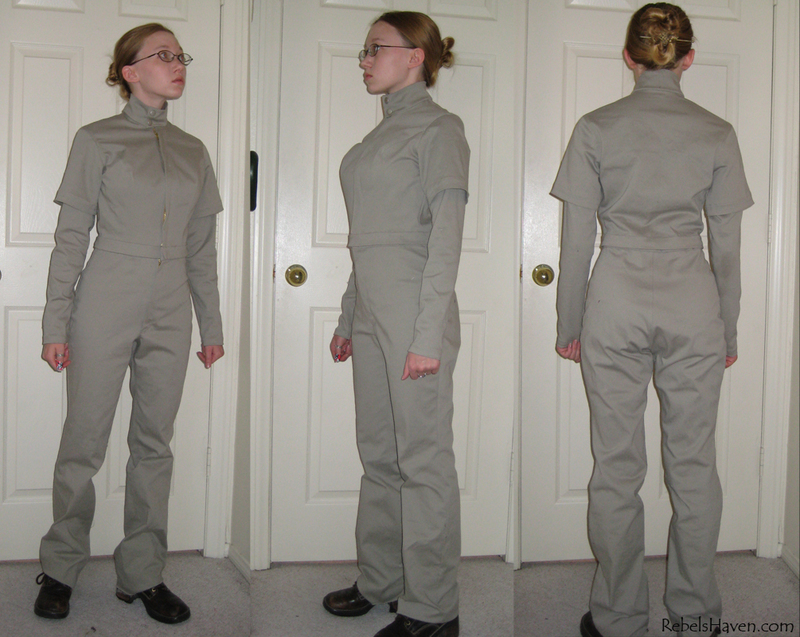 Put on your muslin and either pin closed or zip up your flight suit and try bending, squatting, and sitting. This will give you a clue as to how well fitted your flightsuit is. If pins start popping out in the back when you sit or if it feels tight, add some height to the back of the pants; you will notice your jeans are higher in the back to accomodate the way sitting pulls the pant waistline down. [SLEEVES] You will want relaxed fit but still slim sleeves. You can use a ruler to straighten the lines of the sleeves in the pattern I linked about. 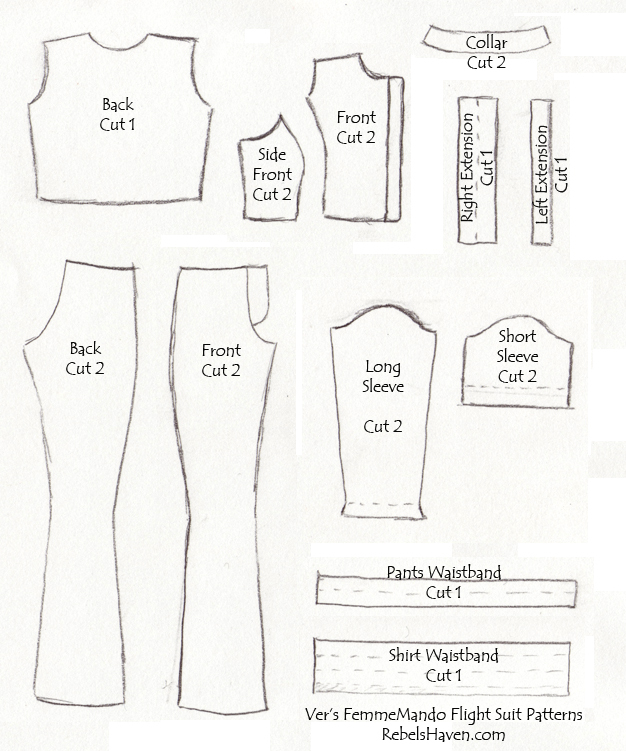 Your outer short sleeves, if you plan to use them will use the same sleeve cap, but instead of the tapered-ness to the sleeves, they will be more like t-shirt sleeves. Determine how long you want the sleeves to be and measure down from the sleeve cap and drap a straight line for your sleeve hem. You will want your sleeves to be straight, so draw a straight line up from your sleeve hem. You can make your hem as wide or skinny as you choose. used an inch and a quarter. It's important to do this step in the muslin. I had to redo my bodice several times because I couldn't move my arms forward and mobility is something to keep in mind with this costume. [COLLAR] I used a mandarin collar for mine, at 2 inches minus seam allowance. I made sure to make mine high enough so you hopefully won't see skin under the helmet. This step can be changed of course if you'd prefer a separate neck seal. A Mandarin collar is pretty straight forward, some people can get away with just making it rectangular. How I made mine was to make it rectangular for the measurement along the back neck. 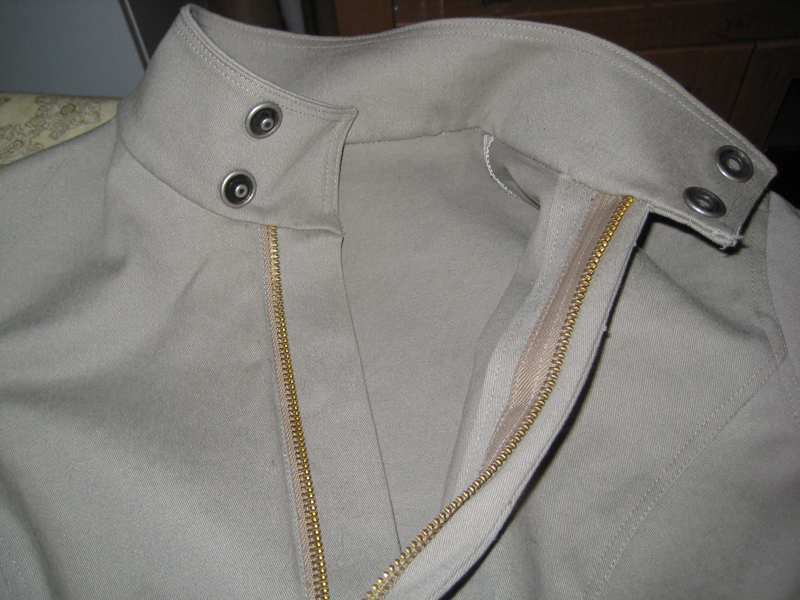 When I got to the shoulder seam, I curved the collar shape up some so it would contour to the neck, to the center front. Remember to figure in the extension you want to the left side; straighten the line out from here. The same is true where the right front attaches to the extension; also pattern this flat. [THE WAISTBANDS] The waistbands will need to be straight. Measure around your pants including the extension, and determine how wide you want the waistband to be. I used 1.25". Double this and add seam allowance to all sides. Meaning, mine for example was 3 inches by 30 inches, and will be folded in half. Sew this on like any normal waistband. 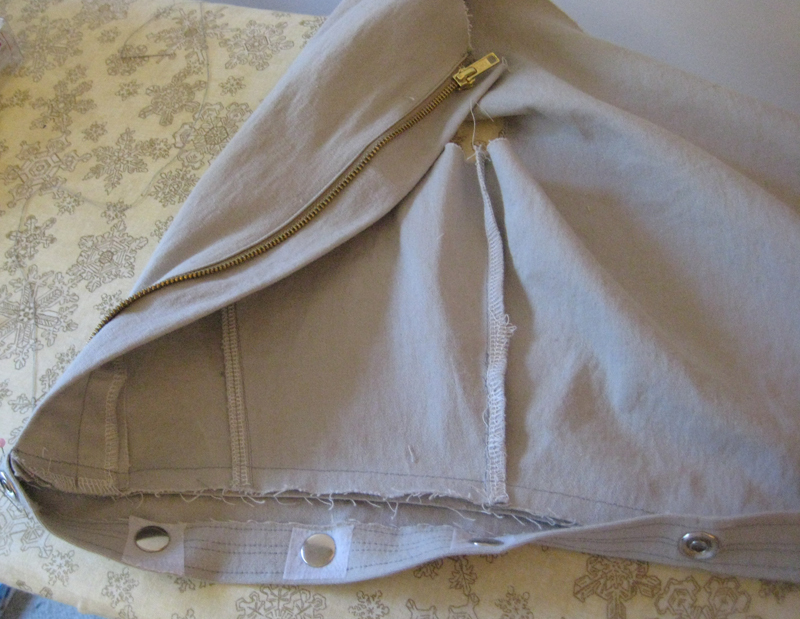 Before you hand-sew down your waistband on the inside, be SURE to trim back your seam allowance! You may have trouble installing your snaps if there is too much fabric to go through. The bodice waistband is a little tricky. The width will need to be the same. The pants will just have the snaps punched through it, but this one has to hide the snaps from the front so it appears to be a one-piece suit. Let's use my measurements of 1.25. This waistband will be folded over 3 times and only have one seam allowance lengthwise, plus the sides. Using a .5 seam allowance, that is a 30 inch long strip at 4.25 wide. Using the iron, fold over 1.5 and press. I then stitched this down with 3 rows of stitches (be sure not to stretch when sewing) to flatten this section as much as possible. Fold over and press again. This will leave you with your .5 inch seam allowance. Unfold your last fold, and fold the opposite way. Your waistband is now inside-out. 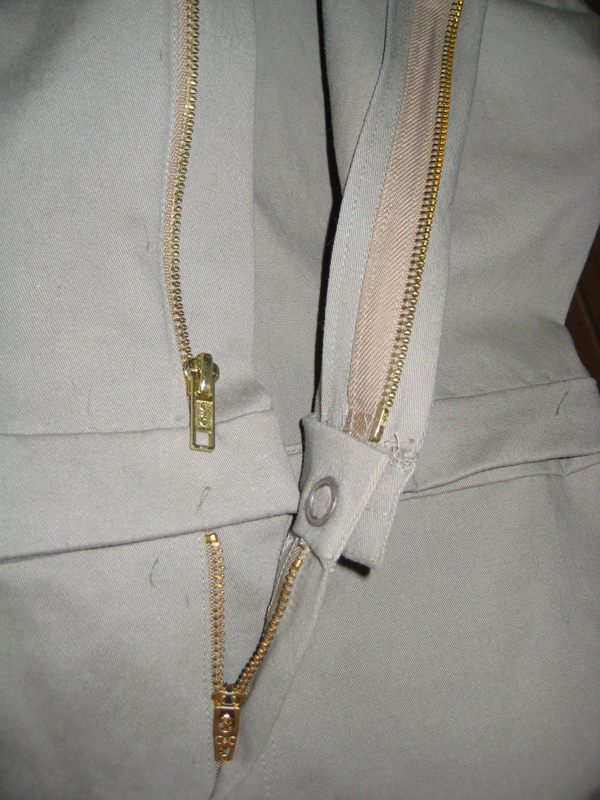 Stitch each of the sides down, trim your seam allowance and re-turn. Stitch this to your bodice so that there is almost a hidden flap on the INSIDE of the bodice. The side you will see on the inside is where you stitched to flatten. This is where your snaps will be hidden.